OTTAWA - The two newest members of the Supreme Court of Canada celebrated their humble origins and their new role as dispassionate defenders of the country's constitutional freedoms during their public welcome Monday to the highest court. Michael Moldaver and Andromache Karakatsanis were named to the court by Prime Minister Stephen Harper last month and were sworn in privately before Monday's formal welcoming ceremony before a courtroom packed with fellow jurists, family members and politicians. They are the third and fourth judges Harper has appointed to the nine-member court. Moldaver, 63, repeatedly sparked laughter with fond, self-deprecating recollections of his working-class youth in Peterborough, Ont., but appeared emotional as he recalled the sacrifices of his parents, neither of whom benefited from the higher education they insisted that their three sons would have. He said when he and his two brothers "started to get letters behind our names" such as BA or PhD, his father began adding his own, such as MD or JD. "MD, of course, standing for metal dealer and JD for junk dealer," Moldaver deadpanned. "To that list, if he were here today, I would add the letters MW — man of wisdom. For he was a man of wisdom, university educated or not. He was blessed with common sense and good judgment and an understanding of the human condition." His mother, Ruth, he said, was devoted to her children and taught them, "we should always remain true to our beliefs and convictions, no matter what others might think or say." Karakatsanis, 56, described how her parents emigrated from Greece after the Second World War to start a new life. "They came without family, without language, without fortune," she said. "But they came with courage and with hope." Moldaver's appointment has been criticized by the NDP because he is not bilingual, though he has said he will study French. Moldaver, who offered a few words in French, said he is guided by the example of his father. He poked fun at the red robe he now wears, saying the last time he wore the colour was when he played the role of Cardinal Wolsey — badly — in a Grade 12 production of Robert Bolt's "A Man For All Seasons". "A perfect role I think you'd agree for a nice Jewish boy from Peterborough," he said, as laughter grew in the normally sombre courtroom, "who had never seen the inside of a confessional, but probably should have." Moldaver also joked about the recent appearance he and Karakatsanis made before an ad-hoc committee of MPs on Parliament Hill after their appointments were announced. "I tell them I found it to be a lot like exercise: it ain't great when it's happening, but it sure feels good when it's over." Both Ontario judges come from the province's appeal court. They replace justices Ian Binnie, 72, and Louise Charron, 60, who retired this fall. 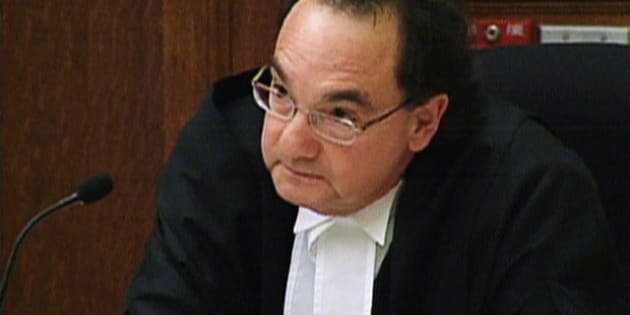 Moldaver was appointed to the Supreme Court of Ontario in 1990 and moved to the appeal court in 1995. Karakatsanis is a former Ontario deputy attorney who was named to the Ontario Superior Court of Justice in 2002 and to the appeal court in 2010. She said her 15 years as an Ontario public servant gave her a deep understanding of the workings of government, and a "profound respect" for the workings of parliamentary democracy. Some pundits have said the appointments give Harper an opportunity to shape a court to his liking — one that will be less likely to engage in what is referred to as judicial activism. However, both new judges have emphasized the impartiality of the judiciary. In his recent committee appearance, Moldaver affirmed the court's right to strike down laws because "we have the right to direct governments on matters of policy. Under the Constitution, we have been given the authority to determine the legality of laws passed by Parliament and the legislatures." Karakatsanis said Monday her career as a public servant and then a judge has reinforced her belief that the rule of law is the cornerstone of democracy and that an independent judiciary is the "very heart" of the system. "We need to ensure that we represent the true values of Canadian society as it applies to the Canadian Charter of Rights and Freedoms. The Supreme Court of Canada is a place where the rule of law is defined and developed."